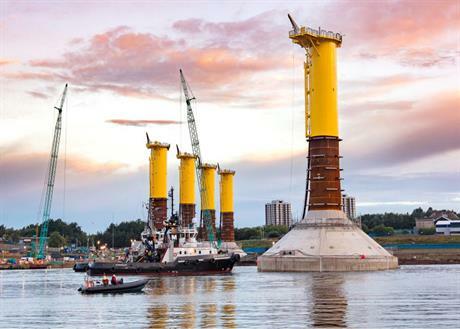 UK: EDF Energy Renewables has started floating the five gravity-base foundations out to its 41.5MW Blyth demonstration project site off north-east England. Five gravity-base foundations built by the Royal Bam Group on the River Tyne have started the journey to the project site 5.7km from the coast. Each of the five foundations will have an MHI Vestas V164 8.3MW turbines installed on them. The turbines will be connected to the UK's grid via a 66kV cable, the first UK project to use the higher capacity link. In October 2014, EDF Energy Renewables acquired the rights to the Blyth test site from the seabed landlord, the Crown Estate. The site has the consent to install up to 99.9MW of capacity. After acquiring Blyth, EDF ER said it would use the project to "grow its expertise and experience in designing and choosing foundations" and develop offshore installation processes. EDF ER contracted VBMS to lay the 14km of export and inter-array cables for the Blyth offshore demonstration project. VBMS will also undertake landfall pull ashore, testing, terminations and commissioning. Nexans has been contracted to supply the cables. The project is due online by the end of the year.